The working process is the same either by executing for yourself or asking a company for the work. Refer to the following instruction on each process. 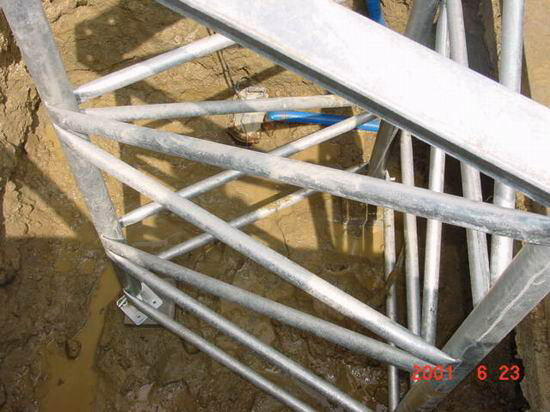 The size of the hole, the depth and working procedure may change by the situation of the site. 1. Decide the position and direction of the place for installation of the tower. Mark △ on the ground with color spray. Then check if both the direction and the place are all right. You can equip the winch on anywhere of one of three faces on the tower. Since the above is related to wiring of power cable of single phase 200V and/or control, you need to decide the direction of installation of the winch face and the stage steps in advance. If you work for yourself, note that you need various tools such as excavator, dump for disposing the remaining ground, level, scoop, chair, scale and so on. 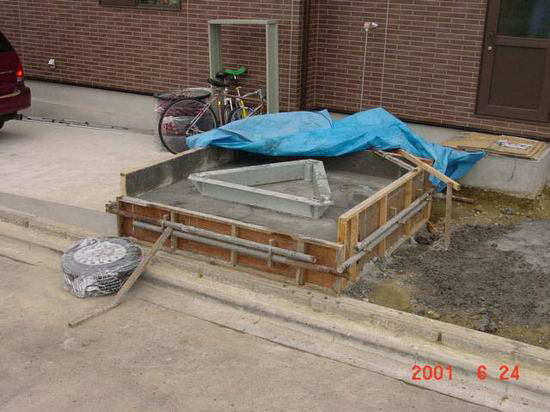 In addition, contact a company of fresh concrete in advance. 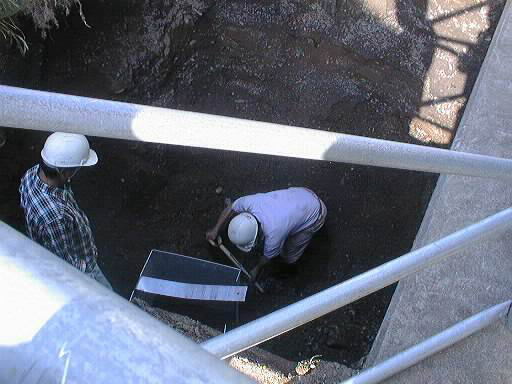 Firstly, start excavation work for the marked place. 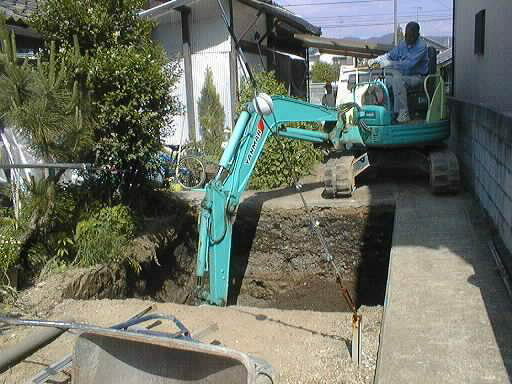 After digging the hole as specified depth, burry the ground plate. After burying the ground, execute a rolling compaction firmly. 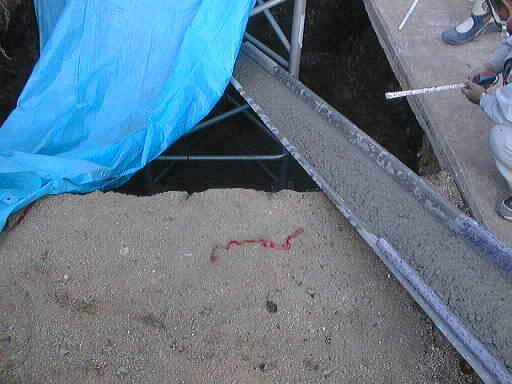 If the rolling compaction is not done firmly, it may cause the foundation to incline. Put the foundation unit into the hole. 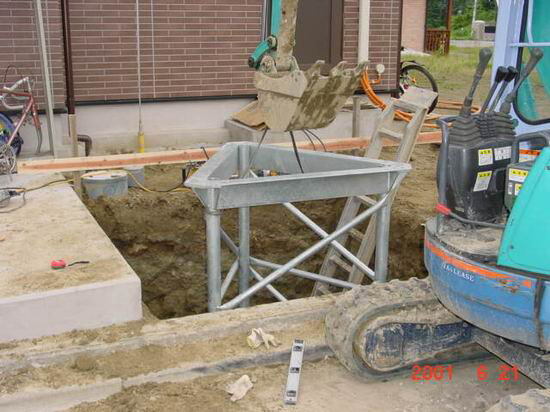 Weld the ground plate to the foundation unit. remove water with a pump. Do this work with careful attention. The surface of the concrete should be finished with making a drainage slope with a trowel neatly. 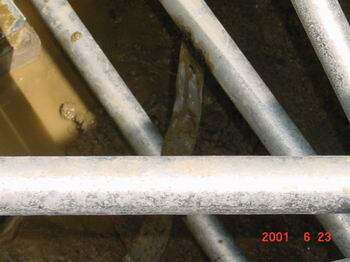 After the concrete has dried up, remove the mold and clean the surface of the flange and the bolt holes of the foundation unit to complete this work.